I got to hear Sanjay speak at VMware's internal WWKO 2017 earlier this year, but I have never heard Mark Russinovich speak, having used his Windows Sysinternals tools regularly for over 2 decades now. Looking forward to all of these keynotes! You're a Veeam Vanguard, right? How did you join the program? I spent a lot of time with Veeam FastSCP a decade ago, helping test the move to 64 bits. Then in 2014, I replaced Windows Home Server with VEB (Veeam Endpoint Backup FREE) very publicly, regularly reporting any issues I encountered, along with providing enhancement ideas. You find stuff when over a dozen family and friends PCs are doing daily backups to your home’s server. I even did a bit of beta testing of Veeam products. I was then nominated and accepted into the (61 member) Veeam Vanguard program. And finally VeeamON is just around the corner, tell us what we should expect from the event? Looking forward to learning and socializing with Veeam folks like Rick Vanover, Clint Wyckoff, Anton Gostev, Doug Hazelman, Neil Condon, and Mike Resseler. Hopefully, I also get to talk some Xeon D with Anthony Spiteri! Maybe I even get the man behind the Dima P. handle on the Veeam forums, who documented Veeam Endpoint Backup FREE database resets. Yes, I’m proud to be a Veeam Vanguard, my 3rd year! Hopefully Anton has forgiven me by now, for getting a bit too creative with the Veeam Endpoint Backup installer back in 2015 (Windows 10 beta) and 2016 (Windows 2016 beta). Oh, and the many VMware colleagues that’ll be there at VeeamOn too. 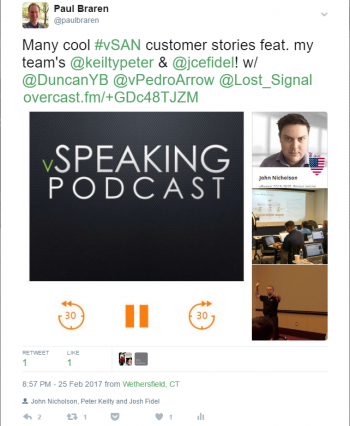 I always love the chance to deep dive chat about vSAN, NVMe, and 3D XPoint, with the likes of John Nicholson. 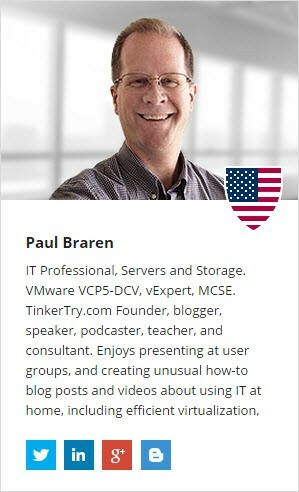 I have since learned that VMware's New Orleans local vSAN and scripting legend Jase McCarty will be there at VeeamON too, see jasemccarty.com/blog and his many posts at Virtual Blocks. I can't wait to (hopefully) catch up with him to nerd about vSAN, Optane, and more! Finally, hopefully I'll get to meet VMware's @vPedroArrow, aka, Pete Flecha! What legend, with his amazingly entertaining and education Virtually Speaking Podcast with John Nicholson. How Veeam Plays a Role in Business Continuity - Problems and Answers!